The first biryani recipe that I came into my mind for the alphabet C is the Chettinadu biryani. 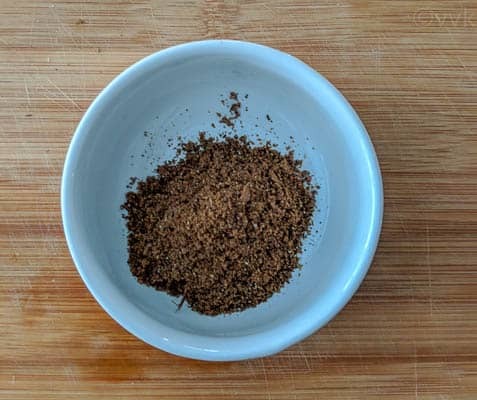 I have already posted that, but I recently learned the authentic Chettinadu masala from our friend, who is a chef. I wanted to try a pulav with that masala, but I shoveled for later as I wanted to share this Calcutta biryani. 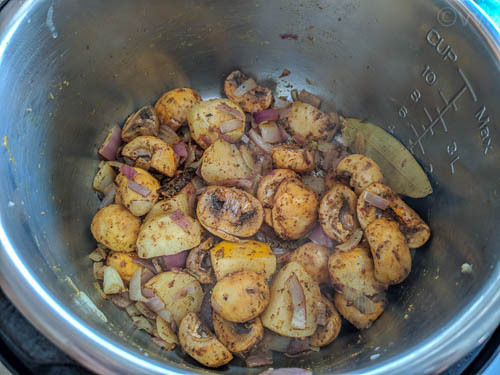 Like every other millennial, I am stuck with the spelling Calcutta even though the Bengali pronunciation has always been “Kolkata.” :-) So, I going with Calcutta veg biryani for the alphabet C. I mainly referred to Bong Eats and Veg Recipes of India website for the recipe but adapted the masala to our taste. Also, I made the biryani in Instant Pot, and I did not follow any DUM process and I did not include any fried onions. Check the notes section for the stove-top pressure cooker version. 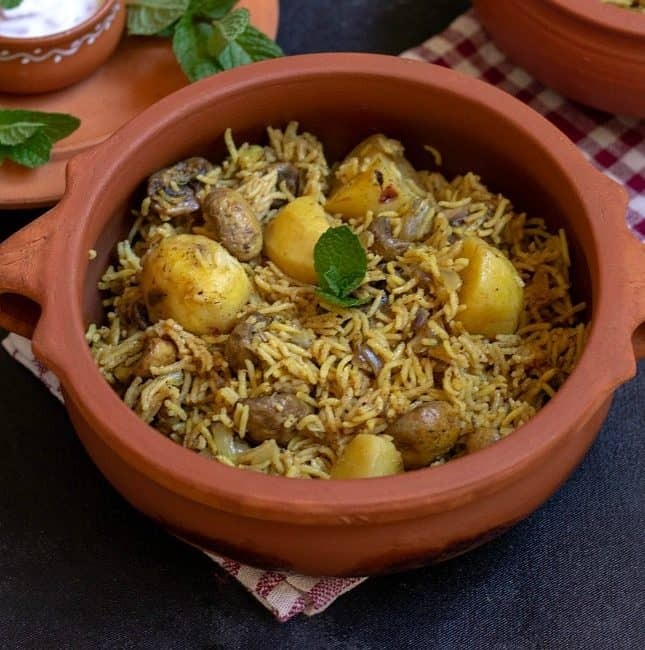 What makes this Calcutta biryani unique? Of course, the freshly ground biryani masala. We use three different peppercorns for this biryani masala – black peppercorns, white peppercorns, and tailed pepper or cubeb peppercorns. The tailed pepper is known as kababchini in Hindi, and you can find them in the Indian grocery stores. But if you can’t see it, replace it with black peppercorns. Same applies for shahi jeera, if you can’t source it then use the regular cumin seeds. You can make this biryani masala well ahead and store it in an air-tight container. Also, this masala can be used for dry curries and stir-frys as well. 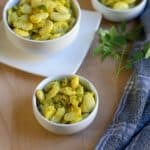 Once you have this masala ready, you can prepare it quickly. The ingredient list might be lengthy but not the recipe. It is pretty straight-forward. 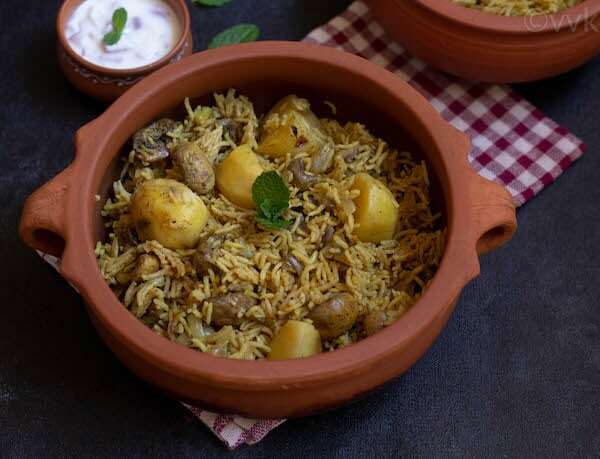 What makes this Calcutta biryani fragrant? Traditionally meeta ittar / edible oil is used for adding that fragrance. But I couldn’t find the right quality here, so I used rose water and kewra essence. Essence is concentrated liquid so a drop or two is more than sufficient whereas flavored water is a bit diluted so you can use 1 to 2 tsps. Depending upon essence or water, adjust the quantity. We use the rose water and kewra water in Hyderabadi biryani as well. 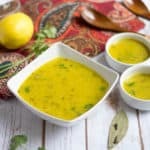 Also, saffron milk adds a unique flavor to the recipe. 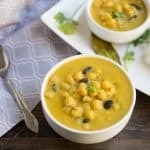 You can make this biryani vegan by skipping the yogurt but add a tsp or two of lemon or lime juice before serving. 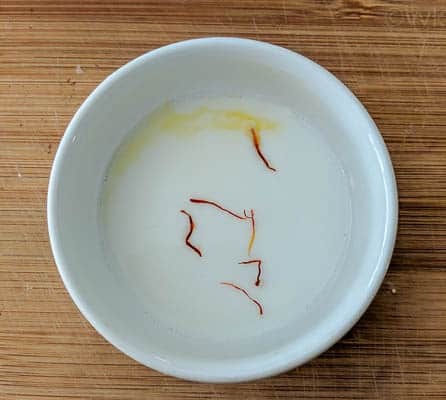 Also, soak the saffron strands in luke-warm water instead of milk. 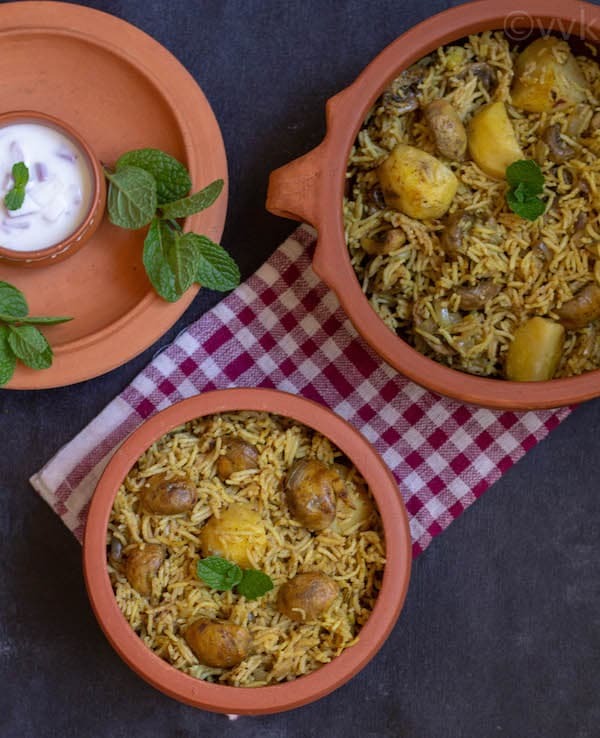 As always, I have written a not-so-big essay, so without any further ado, here is the delicious Instant Pot Kolkata/Calcutta veg biryani recipe. 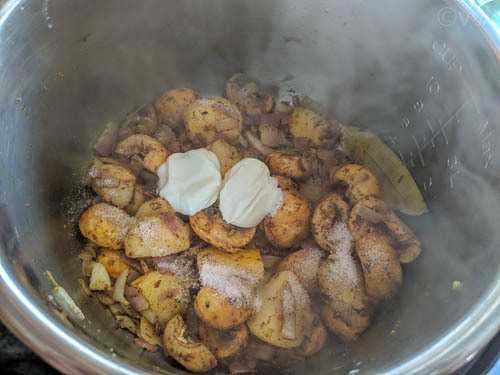 Peel the potatoes and chop them into big chunks. Clean the mushrooms and cut into halves. Dry roast all the ingredients given under “biryani masala” without adding any oil for three to four minutes over medium heat. Allow it to cool and grind into a coarse powder without adding any water. Set the IP in saute mode and when hot add 3 tbsps of oil. Then add the whole spices – bay leaf, fennel seeds, cinnamon, cloves, cardamom and fry for 15 seconds. 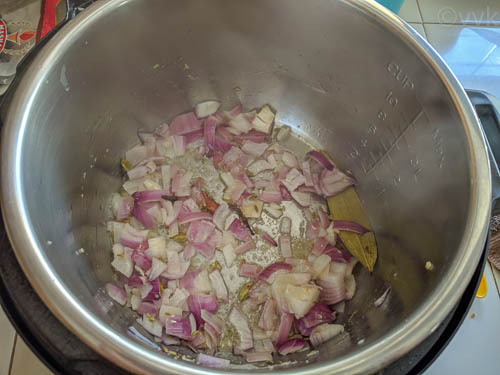 Then add the chopped onion and ginger-garlic paste. 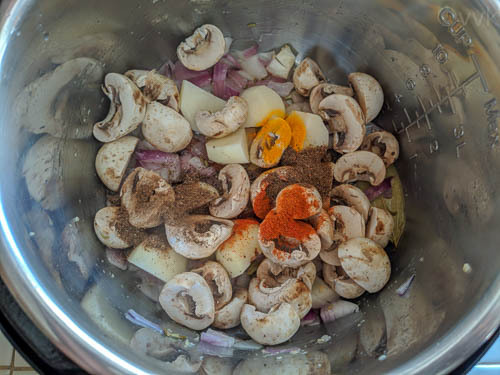 Saute for 45 seconds and add the potatoes and mushrooms. Then add the turmeric powder, red chili powder and 2 tsps of fresh biryani masala. Then add 2 tbsps of yogurt, 1.5 tsp salt and mix thoroughly. Press Cancel and then add water, 1/2 tsp rose water, 1 drop of kewra essence. Add the drained rice and gently mix. Meanwhile, when the IP is doing its job, soak five saffron strands in 2 tbsps of warm milk. Carefully open the lid after releasing the pressure and allow the biryani to cool for 5 minutes. Add the saffron milk and then fluff it up with a fork. If you can’t find kewra water or rose water, you can ignore them but add a tsp of sugar just for the flavor. 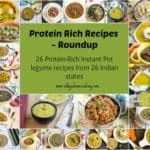 You can make this biryani in stove-top pressure as well. In that case, do not add the pressure cooker weight initially. When the steam comes out of the vent, turn off the heat and then put on the weight. This process naturally acts as DUM for the biryani. Open the pressure cooker lid, after the pressure is all gone. 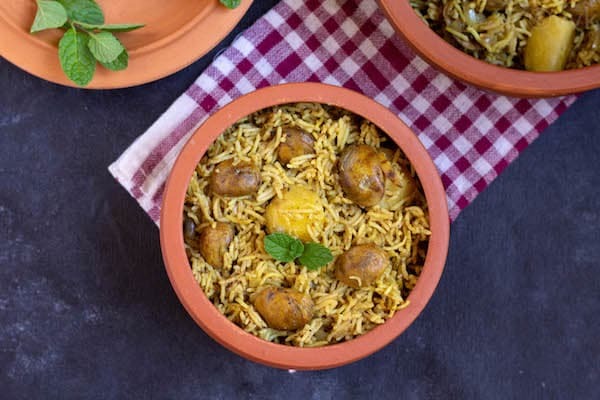 PS: If you try this Instant Pot Kolkata veg biryani recipe, don’t forget to comment and rate the recipe. 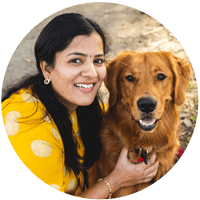 Also, follow my YouTube Channel for new video recipes. 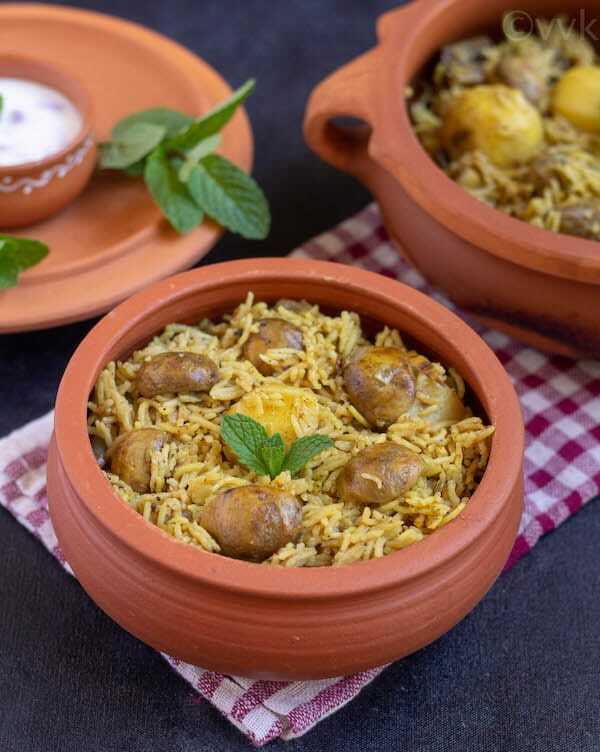 A lip-smacking & a fragrant Calcutta veg biryani with fresh ground biryani masala, potatoes & mushrooms, made in Instant Pot! Dry roast all the ingredients given under "biryani masala" without adding any oil for three to four minutes over medium heat. Then add the whole spices - bay leaf, fennel seeds, cinnamon, cloves, cardamom and fry for 15 seconds. Then add the turmeric powder, red chili powder and 2 tsps of fresh biryani masala and mix well. Then add 2 tbsps of yogurt, 1.5 tsp salt and mix thoroughly. Press Cancel and then add water, 1/2 tsp rose water, 1 drop of kewra essence. If you can't find kewra water or rose water, you can ignore them but add a tsp of sugar just for the flavor. 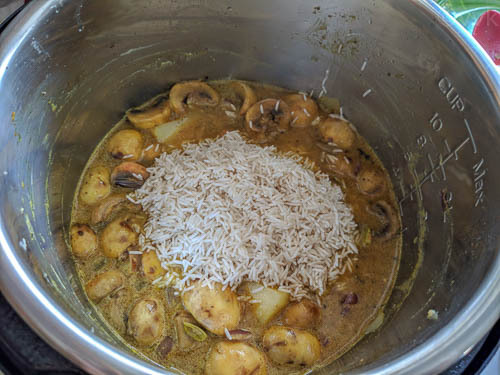 Loved this Instant pot version of calcutta biryani recipe liked the use of mushrooms with potatoes… so rich in flavours.I love your clay dishes that you have used to present briyani!! 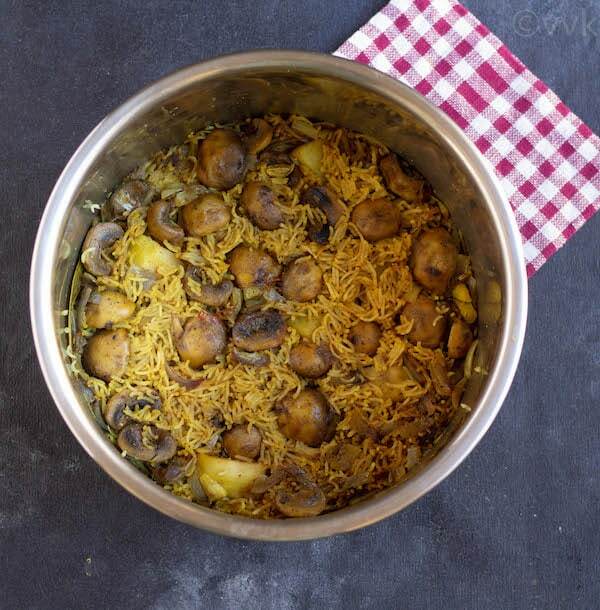 This biryani looks so tasty and flavorful..love your serveware too. Meetha ittar, kabab cheeni and this biryani ! U surely have left no stone unturned ..
Loads of flavours there and perfectly made ! That is an awesome find Vidya. 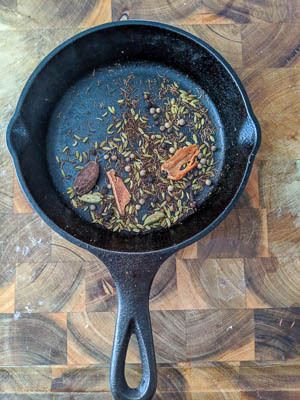 The spice powder sounds so full of flavor and the biryani looks fantastic. 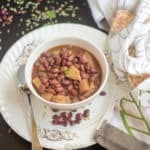 I am getting the aroma of rose and kewra right here , actually I love these two flavours and a Biryani with them totally rocks ! Awesome pick and a fantastic one , jotting down the Biryani masala , sounds so flavourful . :-) :-) Thanks a lot Vaishali. The biryani masala surely sounds exotic. Very lovely preparation. And great to have a vegetarian version. OMG! Such a long list of spices. But the biryani looks amazing. he he yes, but you can prepare it well ahead. :-) Thanks Harini. These biryanis with a ‘region’ tag seem to be pretty famous and classic ones, a fact I realized only when I started to explore for this BM. You seemed to have nailed the vegetarian version. Oh yeah, definitely. Thanks Suma. Calcutta biryani is such an amazingly flavorful dish and you have made such a tempting pot of biryani!! Love the clay pot too…looks fabulous! 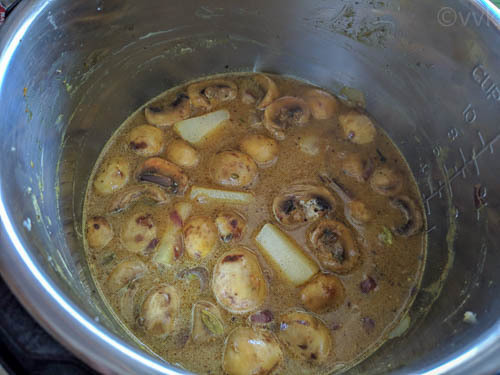 Potato and Mushroom makes a yumm Combo!! Alos i loved your earthenware Serve-ware.. Super cool! !